For the 1964 film, see Navarathri (1964 film). For the 1966 film, see Navaratri (1966 film). Navaratri (Sanskrit: नवरात्रि, lit. Nine nights), also spelled Navratri, Nauratri, Navarathri, Navratam, or Nauratam, is a nine nights (and ten days) Hindu festival, celebrated in the autumn every year. It is observed for different reasons and celebrated differently in various parts of the Indian subcontinent. Theoretically, there are four seasonal Navaratri. However, in practice, it is the post-monsoon autumn festival called Sharada Navaratri that is the most observed in the honor of the divine feminine Devi (Durga). The festival is celebrated in the bright half of the Hindu calendar month Ashvin, which typically falls in the Gregorian months of September and October. In the eastern and northeastern states of India, the Durga Puja is synonymous with Navaratri, wherein goddess Durga battles and emerges victorious over the buffalo demon to help restore Dharma. In the northern and western states, the festival is synonymous with "Rama Lila" and Dussehra that celebrates the battle and victory of god Rama over the demon king Ravana. In southern states, the victory of different goddesses, of Rama or Saraswati is celebrated. In all cases, the common theme is the battle and victory of Good over Evil based on a regionally famous epic or legend such as the Ramayana or the Devi Mahatmya. Celebrations include stage decorations, recital of the legend, enacting of the story, and chanting of the scriptures of Hinduism. The nine days are also a major crop season cultural event, such as competitive design and staging of pandals, a family visit to these pandals and the public celebration of classical and folk dances of Hindu culture. On the final day, called the Vijayadashami or Dussehra, the statues are either immersed in a water body such as river and ocean, or alternatively the statue symbolizing the evil is burnt with fireworks marking evil's destruction. The festival also starts the preparation for one of the most important and widely celebrated holidays, Diwali, the festival of lights, which is celebrated twenty days after the Vijayadashami or Dussehra. The word Navaratri means 'nine nights' in Sanskrit, nava meaning nine and ratri meaning nights. 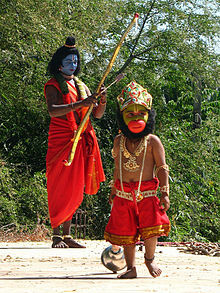 In Northern, Central and Western states of India, the Ramalila play is enacted during Navaratri by rural artists (above). Navaratri festival is an occasion of classical and folk dance performances at Hindu temples. In picture the Ambaji Temple of Gujarat. According to some Hindu texts such as the Shakta and Vaishnava Puranas, Navaratri theoretically falls twice or four times a year. Of these, the Sharada Navaratri near autumn equinox (September-October) is the most celebrated and the Vasanta Navaratri near spring equinox (March-April) is next most significant to the culture of Indian subcontinent. In all cases, Navaratri falls in the bright half of the Hindu luni-solar months. The celebrations vary by region, leaving much to the creativity and preferences of the Hindu. Sharada Navaratri: the most celebrated of the four navaratris, named after sharada which means autumn. It is observed the lunar month of Ashvin (post-monsoon, September–October). In many regions the festival falls after autumn harvest, and in others during harvest. Magha Navaratri: in Magha (January–February), winter season. The fifth day of this festival is often independently observed as Vasant Panchami or Basant Panchami, the official start of spring in the Hindu tradition wherein goddess Saraswati is revered through arts, music, writing, kite flying. In some regions, the Hindu god of love, Kama is revered. Ashada Navaratri: in Ashadha (June–July), start of the monsoon season. The Sharada Navaratri commences on the first day (pratipada) of the bright fortnight of the lunar month of Ashvini. The festival is celebrated for nine nights once every year during this month, which typically falls in the Gregorian months of September and October. The exact dates of the festival are determined according to the Hindu luni-solar calendar, and sometimes the festival may be held for a day more or a day less depending on the adjustments for sun and moon movements and the leap year. The festivities extend beyond goddess Durga and god Rama. Various other goddesses such as Saraswati and Lakshmi, gods such as Ganesha, Kartikeya, Shiva and Krishna are regionally revered. For example, a notable pan-Hindu tradition during Navaratri is the adoration of Saraswati, the Hindu goddess of knowledge, learning, music and arts through Ayudha Puja. On this day, which typically falls on the ninth day of Navaratri after the Good has won over Evil through Durga or Rama, peace and knowledge is celebrated. Warriors thank, decorate and worship their weapons, offering prayers to Saraswati. Musicians upkeep their musical instruments, play and pray to them. Farmers, carpenters, smiths, pottery makers, shopkeepers and all sorts of trades people similarly decorate and worship their equipment, machinery and tools of trade. Students visit their teachers, express respect and seek their blessings. This tradition is particularly strong in South India, but is observed elsewhere too. Known as Pratipada, this day is associated to Shailaputri (literally "Daughter of Mountain"), an incarnation of Parvati. It is in this form that the Goddess is worshiped as the consort of Shiva; she is depicted as riding the bull, Nandi, with a trishula in her right hand and lotus in her left. Shailaputri is considered to be the direct incarnation of Mahakali. The color of the day is red, which depicts action and vigor. On Dwitiya, Goddess Brahmacharini, another incarnation of Parvati, is worshiped. In this form, Parvati became Sati, her unmarried self. Brahmacharini is worshiped for emancipation or moksha and endowment of peace and prosperity. Depicted as walking bare feet and holding a japamala and kamandal in her hands, she symbolizes bliss and calm. The peacock blue is the colour code of this particular day. Blue colour depicts tranquility yet strong energy. Tritiya commemorates the worship of Chandraghanta - the name derived from the fact that after marrying Shiva, Parvati adorned her forehead with half-chandra (lit. moon). She is the embodiment of beauty and is also symbolic of bravery. Yellow is the colour of the third day, which is a vivacious colour and can pep up everyone's mood. Goddess Kushmanda is worshiped on Chaturthi. Believed to be the creative power of universe, Kushmanda associated to the endowment of vegetation on earth and hence, the color of the day is Green. She is depicted as having eight arms and sits on a Tiger. Skandamata, the goddess worshiped on Panchami, is the mother of Skanda (or Kartikeya). The color Grey is symbolic of the transforming strength of a mother when her child is confronted with danger. She is depicted riding a ferocious lion, having four arms and holding her baby. Born to a sage, Katyayana, she is an incarnation of Durga and is shown to exhibit courage which is symbolized by the color Orange. Known as the warrior goddess, she is considered one of the most violent forms of Goddess Parvati. In this avatar, Kātyāyanī rides a lion and has four hands. Considered the most ferocious form of Goddess Durga, Kalaratri is revered on Saptami. It is believed that Parvati removed her fair skin to kill the demons Sumbha and Nisumbha. The color of the day is White. On Saptami, the Goddess appears in a white colour attire with a lot of rage in her fiery eyes, her skin turns black. The white colour portrays prayer and peace, and ensures the devotees that the Goddess will protect them from harm. Mahagauri symbolizes intelligence and peace. The color associated to this day is Pink which depicts optimism. On the last day of the festival also known as Navami, people pray to Siddhidhatri. Sitting on a lotus, she is believed to possess and bestows all type of Siddhis. Here she has four hands. Also known as Saraswati Devi. The light blue colour of the day portrays an admiration towards the nature's beauty. Navaratri is celebrated in different ways throughout India. Some fast, others feast. Some revere the same Mother Goddess but different aspects of her, while others revere avatars of Vishnu, particularly of Rama. The Chaitra Navaratri culminates in Rama Navami on the ninth day, and the Sharada Navaratri culminates in Durga Puja and Dussehra. The Rama Navami remembers the birth of Rama, preceded by nine days of Ramayana recital particularly among the Vaishnava temples. In the past, Shakta Hindus used to recite Durga's legends during the Chaitra Navaratri, but this practice around the spring equinox has been declining. For most contemporary Hindus, it is the Navaratri around the autumn equinox that is the major festival and the one observed. To Bengali Hindus and to Shakta Hindus outside of eastern and northeastern states of India, the term Navaratri implies Durga Puja in the warrior goddess aspect of Devi. In other traditions of Hinduism, the term Navaratri implies something else or the celebration of Hindu goddess but in her more peaceful forms such as Saraswati – the Hindu goddess of knowledge, learning, music and other arts. In Nepal, Navaratri is called Dasain, and is a major annual homecoming and family event that celebrates the bonds between elders and youngsters with Tika Puja, as well as across family and community members. The Navaratri is celebrated as the Durga Puja festival in West Bengal. It is the most important annual festival to Bengali Hindus and a major social and public event in eastern and northeastern states of India, where it dominates the religious life. The occasion is celebrated with thousands of temporary stages called pandals are built in community squares, roadside shrines and large Durga temples in West Bengal, Odisha, Jharkhand, Bihar, eastern Nepal, Assam, Tripura and nearby regions. It is also observed by some Shakta Hindus as a private, home-based festival. Durga Puja festival marks the battle of goddess Durga with the shape-shifting, deceptive and powerful buffalo demon Mahishasura, and her emerging victorious. The last five days of Navratri mark the popular practices during Durga Puja. The festival begins with Mahalaya, a day where Shakta Hindus remember the loved ones who have died, as well the advent of warrior goddess Durga. The next most significant day of Durga Puja celebrations is the sixth day, called Shashthi where the local community welcome the goddess Durga Devi and festive celebrations are inaugurated. On the seventh day (Saptami), eighth (Ashtami) and ninth (Navami), Durga along with Lakshmi, Saraswati, Ganesha and Kartikeya are revered and these days mark the main Puja (worship) with recitation of the scriptures, the legends of Durga in Devi Mahatmya and social visits by families to elaborately decorated and lighted up temples and pandals (theatre like stages). After the nine nights, on the tenth day called Vijayadashami, a great procession is held where the clay statues are ceremoniously walked to a river or ocean coast for a solemn goodbye to Durga. Many mark their faces with vermilion (sindooram) or dress in something red. It is an emotional day for some devotees, and the congregation sings emotional goodbye songs. After the procession, Hindus distribute sweets and gifts, visit their friends and family members. 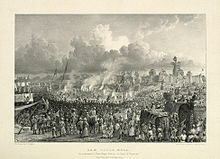 An 1834 sketch by James Prinsep showing Rama Leela Mela during Navaratri in Benares. In North India, Navaratri is marked by the numerous Ramlila events, where episodes from the story of Rama and Ravana are enacted by teams of artists in rural and urban centers, inside temples or in temporarily constructed stages. This Hindu tradition of festive performance arts was inscribed by UNESCO as one of the "Intangible Cultural Heritage of Humanity" in 2008. The festivities, states UNESCO, include songs, narration, recital and dialogue based on the Hindu text Ramacharitmanas by Tulsidas. It is particularly notable in historically important Hindu cities of Ayodhya, Varanasi, Vrindavan, Almora, Satna and Madhubani – cities in Uttar Pradesh, Uttarakhand, Bihar and Madhya Pradesh. The festival and dramatic enactment of the virtues versus vices filled story is organized by communities in hundreds of small villages and towns, attracting a mix of audience from different social, gender and economic backgrounds. In many parts, the audience and villagers join in and participate spontaneously, some helping the artists, others helping with stage set up, create make-up, effigies and lights. The most famous Navaratri festival is organized at Katra in Jammu Province. It is an annual event promoted by Directorate of Tourism, Jammu and Shri Mata Vaishno Deviji Shrine Board. Hundreds of thousands of devotees pay their attendance at Katra for the festival. Navaratri has historically been a prominent ritual festival for kings and military of a kingdom. At the end of the Navratri, comes Dussehra, where the effigies of Ravana, Kumbhakarna, and Meghanada are burnt to celebrate the victory of good (Rama) over evil forces on Vijayadashami. Navratri is also a festival for feasting with friends and family. Elsewhere, during this religious observance, goddess Durga's war against deception and evil is remembered. A pot is installed (ghatasthapana) at a sanctified place at home. A lamp is kept lit in the pot for nine days. The pot symbolises the universe. The uninterrupted lit lamp symbolizes the Adishakti, i.e. Durga Devi. In parts of Bihar, goddess Durga is revered during the autumn Navaratri. In other parts, such near Sitamarhi close to Nepal border, the spring Navratri attracts a large Ramanavami fair which marks the birth of Lord Rama as well as a reverence for his wife Sita who legends place was born at Sitamarhi. It is the largest cattle trading fair, and attracts a large handicrafts market in pottery, kitchen and house ware, as well as traditional clothing. Festive performance arts and celebrations are held at the local Hindu temple dedicated to Sita, Hanuman, Durga, and Ganesha. Navaratri festival in Gujarat is one of the main festivals. The traditional method includes fasting for a day, or partially every of the nine days such as by not eating grains or just taking liquid foods, in remembrance of one of nine aspects of Shakti goddess. The prayers are dedicated to a symbolic clay pot called garbo, as a remembrance of womb of the family and universe. The clay pot is lit, and this is believed to represent the one Atman (soul, self). Garba dancing is a Navaratri tradition in Gujarat. In Gujarat and nearby Hindu communities such as in Malwa, the garbo significance is celebrated through performance arts on all nine days. The most visible is group dances from villages to towns called Garba accompanied by live orchestra, seasonal raga or devotional songs. 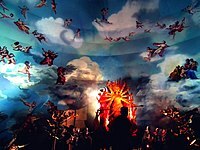 It is a folk dance, where people of different background and skills join and form concentric circles. The circles can grow or shrink, reaching sizes of 100s, sometimes 1000s of people, dancing and clapping in circular moves, in their traditional costumes, at the same time. The garba dance sometimes deploys dandiyas (sticks), coordinated movements and striking of sticks between the dancers, and teasing between the genders. Post dancing, the group and the audience socializes and feasts together. Regionally, the same thematic celebration of community songs, music and dances on Navaratri is called garbi or garabi. Some regions produce and sell special Navaratri miniature golu dolls, such as of Krishna above. In the temples of Goa, on the first day of the Hindu month of Ashwin, in temples (and some households), a copper pitcher is installed surrounded by clay in which nine varieties of food grains are placed inside the sanctum sanctorum of Devi and Krishna temples. The nine nights are celebrated by presenting devotional songs, and through religious discourses. Artists arrive to perform folk musical instruments. Celebrations include placing the goddess image in a specially-decorated colourful silver swing, known as Makhar in Konkani language and for each of the nine nights, she is swung to the tune of temple music (called as ranavadya) and devotees singing kirtan and waving lamps. This is locally called Makharotsav. The last night of the Goa Navaratri festival is a major celebration and attracts larger participation. It is locally called the makhar arati.. In Karnataka, Navaratri is observed by lighting up Hindu temples, cultural sites and my regal processions. It is locally called Dasara and it is the state festival (Nadahabba) of Karnataka. Of the many celebrations, the Mysuru Dasara is a major one and is popular for its festivities. The contemporary Dasara festivities at Mysore are credited to the efforts of King Raja Wodeyar I in 1610. On the ninth day of Dasara, called Mahanavami, the royal sword is worshipped and is taken on a procession of decorated elephants and horses. The day after Navratri, on the Vijayadashami day, the traditional Dasara procession is held on the streets of Mysore. An image of the Goddess Chamundeshwari is placed on a golden saddle (hauda) on the back of a decorated elephant and taken on a procession, accompanied by tableaux, dance groups, music bands, decorated elephants, horses and camels. Ayudha Puja is dedicated to Saraswati goddess, on the ninth day of Dasara, where military personnel upkeep their weapons and families upkeep their tools of livelihood, both offering a prayer to Saraswati as well as Parvati and Lakshmi. Another Navaratri tradition in Karnataka has been decorating a part of one's home with art dolls called Gombe or Bombe, similar to Golu dolls of Tamil Nadu. An art themed Gaarudi Gombe, featuring folk dances which incorporate these dolls, is also a part of the celebration. A family preparing for Saraswati puja on Navaratri. In Kerala and in some parts of Karnataka three days: Ashtami, Navami, and Vijaya Dashami of Sharada Navarathri are celebrated as Sarasvati Puja in which books are worshiped. The books are placed for Puja on the Ashtami day in own houses, traditional nursery schools, or in temples. On Vijaya Dashami day, the books are ceremoniously taken out for reading and writing after worshiping Sarasvati. Vijaya Dashami day is considered auspicious for initiating the children into writing and reading, which is called Vidyāraṃbhaṃ. 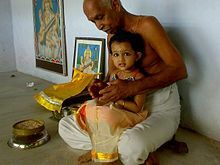 The Vidyarambham day tradition starts with the baby or child sitting on the lap of an elderly person such as the grandfather, near images of Saraswati and Ganesha. The elder writes a letter and the child writes the same with his or her index finger. This Hindu tradition is so popular that Christian organizations have copied it and ritually observe it inside many churches. However, Navratri traditions of Hindus is not the only tradition observed by Kerala Christians, many other Hindu ritual traditions are celebrated in Churches. The Navaratri celebrations vary across Maharashtra and the specific rites differ between regions even if they are called the same and dedicated to the same deity. The most common celebration begins on the first day of Navaratri with Ghatasthapana (sthapana of a ghat), which literally means "mounting of a jar". On this day, rural households mount a copper or brass jar, filled with water, upon a small heap of rice kept on a wooden stool (pat). Additionally, with the jar, is typically placed other agriculture symbols such as turmeric root, leaves of mango tree, coconut and major staple grains (usually eight varieties). A lamp is lighted symbolizing knowledge and household prosperity, and kept alight through the nine nights of Navaratri. The family worship the pot for nine days by offering rituals and a garland of flowers, leaves, fruits, dry-fruits, etc. with a naivedya, and water is offered in order to get the seeds sprouted. Some families also celebrate Kaali pujan on days 1 and 2, Laxmi pujan on days 3, 4, 5 and Saraswati puja on days 6, 7, 8, 9 along with Ghatasthapana. On the eighth day, a "Yajna" or "Hom" is performed in the name of Goddess Durga. On ninth day, the Ghat puja is done and the Ghat is dissolved after taking off the sprouted leaves of the grains. In many families, a woman from Matang community is called and offered food and blessings are sought from her. She is considered as a form of the Goddess "Matangi". The fifth day worship of goddess Lalita is unusually common in Maharashtra. On the ninth day day (navami) of the festival, men participate in Ayudha Puja like the rest of India where all sorts of tools, weapons, vehicles and productive instruments are maintained, decorated, thanked and worshipped. Navaratri has been a historic tradition within Tamil Nadu, with Lakshmi, Saraswati and Durga goddesses the focus. Like the rest of India, the festival has been an occasion for performance arts, particularly Hindu temple dances such as Bharatanatyam and Mohiniyattam. Major palaces, community centers and historic temples have embedded dance halls. For example, the Padmanabhapuram Palace built about 1600 CE has had a large dance hall with intricately carved pillars, a structure entirely made of stone. This dance hall has traditionally been known as Navratri Mantapa. The festivities begin with Vedic chants inaugurating the dances and other ceremonies. Other Tamil Hindu temples, such as those associated with Sri Vaishnavism, also celebrate the Navarathri festivities. A large sculpted dance hall inside Padmanabhapuram Palace near Kanyakumari is called Navarathri Mandapam. It features goddess Saraswati and large dance hall. 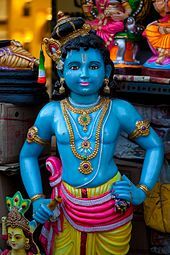 Another notable Tamil tradition is a celebration of the festival with Golu dolls (also spelled as Gollu). These include gods, goddesses, animals, birds and rural life all in a miniature design. People set up their own creative themes in their homes, called Kolu, friends and families invite each other to visit their homes to view Kolu displays, then exchange gifts and sweets. This tradition is also found in other parts of South India such as Andhra Pradesh where it called Bommala Koluvu, and Karnataka where it is called Gombe Habba or Gombe totti. Evidence of Gombe totti tradition as a Hindu celebration of the artisan arts goes back to at least the 14th-century Vijayanagara Empire. In the evening of "Vijayadasami", any one doll from the "Kolu" is symbolically put to sleep and the Kalasa is moved a bit towards North to mark the end of that year's Navaratri Kolu. The family offers a prayer of thanks, and wraps up the display. In temples of Tamil Nadu, Navaratri is celebrated for the Devi's dwelling in each temples. The temples are decorated, ceremonial lamps are lit, and Vedic chantings are performed. Popular Tamil Nadu temples celebrating Navaratri are Madurai Meenakshi Temple, Chennai Kapaleeswarar temple, Kulasekarapattinam Devi temple, Perambur Ellaiamman temple, Srirangam Ranganathan temple and 8th century Kumari Amman temple. Priests and visitors to some of these temples wear a special yellow colored 'promise of protection' thread on their wrists, called kappu (Tamil) or raksha bandhana (Sanskrit). It is believed to symbolize a vow to the goddess and protection from the goddess against evil. A lamp above a Bathukamma flower arrangement, a Telugu Navaratri tradition. In Telangana, Navaratri is celebrated as in the rest of India and it ends with Dasara. During the Navaratri nights, a notable Telangana tradition involves Telugu Hindu women who produce Bathukamma for Navratri goddesses. It is an artistic flower decorations driven event, particularly using marigolds, which revere three different aspects Devi, called Tridevi. In 2016, 9.292 women simultaneously participated to create a 20 feet high flower arrangements, one of the world's largest festive flower arrangement. First three days, the goddess Durga (Parvati) is revered. The next three days, goddess Lakshmi is worshipped. Over the last three days, locals revere the goddess of wisdom, Saraswati. In order to have all-round success in life, believers seek the blessings of all three aspects of the divine femininity, hence the nine nights of worship. Like elsewhere in India, Ayudha Puja is observed by Telangana Hindus where weapons are maintained, decorated and worshipped. Tradesmen and farmers similarly clean up, decorate and worship their own equipment of trade. The Rajput of Rajasthan worship their weapons and horses on Navratri, and formerly offered a sacrifice of a goat to a goddess revered as Kuldevi – a practice that continues in some places. The ritual requires slaying of the animal with a single stroke. In the past this ritual was considered a rite of passage into manhood and readiness as a warrior. The Kuldevi among these Rajput communities is a warrior-pativrata guardian goddess, with local legends tracing reverence for her during Rajput-Muslim wars. The tradition of animal sacrifice is being substituted with vegetarian offerings to the Goddess in temples and households around Banaras in Northern India. The Hindu diaspora that migrated as indentured servants during colonial era to various plantations and mines around the world, as well as those who migrated on their own, continued to mark their Navaratri traditions. 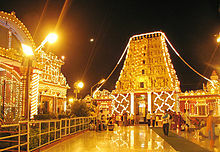 Tamil Hindus in Malaysia, Singapore and Thailand, for example, built Hindu temples in southeast Asia in the 19th century, and Navratri has been one of their major traditional festivals. In Trinidad and United Kingdom, Navratri and Diwali have been one of the most visible celebrations of the local Hindu communities from about mid 20th-century. Navaratri and goddess worship is mentioned in the historic Sikhism literature, particularly in the Dasam Granth traditionally attributed to Guru Gobind Singh. According to Louis Fenech, the Sikhs have historically mirrored the reverence for Devi Shakthi and the worship of weapons in a manner similar to those by Shakta Hindus. The second Guru of Sikhism, Guru Angad was an ardent devotee of goddess Durga. The Jains have observed the social and cultural celebrations of Navaratri with Hindus, such as the folk dances. The stavan poetry of Jainism, states M. Whitney Kelting, "draw much of their imagery from the garba poems" of Hinduism. ^ In these cases, Shaktism devotees consider animal sacrifice distasteful, practice alternate means of expressing devotion while respecting the views of others in their tradition. A statue of asura demon made of flour, or equivalent, is immolated and smeared with vermilion to remember the blood that had necessarily been spilled during the war. Other substitutes include a vegetal or sweet dish considered equivalent to the animal. ^ a b c d e Christopher John Fuller (2004). The Camphor Flame: Popular Hinduism and Society in India. Princeton University Press. pp. 108–109. ISBN 978-0-69112-04-85. ^ Drik Panchag. "Navratri 2019 detailed calendar". ^ a b c d Encyclopedia Britannica 2015. ^ a b c d James G. Lochtefeld 2002, pp. 468-469. ^ a b Robin Rinehart (2004). Contemporary Hinduism: Ritual, Culture, and Practice. ABC-CLIO. pp. 147–148. ISBN 978-1-57607-905-8. ^ Sue Penney (2008). Hinduism. Heinemann. pp. 30–31. ISBN 978-1-4329-0314-5. ^ Ellen Koskoff (2008). The Concise Garland Encyclopedia of World Music: The Middle East, South Asia, East Asia, Southeast Asia. Routledge. pp. 992, 1015–1016. ISBN 978-0-415-99404-0. ^ Susan B. Gall; Irene Natividad (1995). The Asian-American Almanac. Gale Research. p. 24. ISBN 978-0-8103-9193-2. ^ Rina Singh (2016). Diwali. Orca. pp. 17–18. ISBN 978-1-4598-1008-2. ^ a b c d e Christopher John Fuller (2004). The Camphor Flame: Popular Hinduism and Society in India. Princeton University Press. pp. 108–127. ISBN 978-0-69112-04-85. ^ S Sivapriyananda (1995). Mysore Royal Dasara. Abhinav Publications. pp. 21–22. ^ The Illustrated Weekly of India, Volume 96. Bennett, Coleman & Company. 1975. p. 37. ^ James G. Lochtefeld 2002, pp. 741-742. ^ R. Manohar Lall (1933). Among the Hindus: A Study of Hindu Festivals. Asian Educational Services. pp. 27–33. ISBN 978-81-206-1822-0. ^ a b c d Nilima Chitgopekar (2009). Book Of Durga. Penguin Books. pp. 111–114. ISBN 978-0-14-306767-2. ^ Nicholas B. Dirks (1993). The Hollow Crown: Ethnohistory of an Indian Kingdom. University of Michigan Press. pp. 39–40. ISBN 0-472-08187-X. ^ a b Maithily Jagannathan (2005). South Indian Hindu Festivals and Traditions. Abhinav Publications. pp. 115–117. ISBN 978-81-7017-415-8. ^ a b "Navratri 2017: Why Navratri is celebrated for 9 days - Times of India". The Times of India. Retrieved 2018-01-06. ^ "Navratri 2017: Significance of Sharad Navratri, Date, Puja, Prasad and Celebrations". NDTV.com. Retrieved 2018-01-06. ^ "Navratri 2017: 9 avatars of Goddess Durga worshipped on the 9 days". The Indian Express. 2017-09-22. Retrieved 2018-01-06. ^ "What is Navratri? What do these nine days of festivities mean?". Retrieved 2018-01-06. ^ "Navratri Festival,Navratri Festival India,Navaratri Celebrations In India,Durga Navratri,Goddess Durga Festival". www.newsonair.nic.in. Retrieved 2018-01-06. ^ a b Christian Roy (2005). Traditional Festivals: A Multicultural Encyclopedia. ABC-CLIO. pp. 304–310. ISBN 978-1-57607-089-5. ^ a b c Christian Roy (2005). Traditional Festivals: A Multicultural Encyclopedia. ABC-CLIO. p. 310. ISBN 978-1-57607-089-5. ^ Rachel Fell McDermott 2001, pp. 172-174. ^ a b Malcolm McLean 1998, p. 137. ^ Christian Roy (2005). Traditional Festivals: A Multicultural Encyclopedia. ABC-CLIO. pp. 306–307. ISBN 978-1-57607-089-5. ^ David Kinsley 1988, pp. 106-108. ^ Lynn Foulston & Stuart Abbott 2009, pp. 162-169. ^ Alain Daniélou 1991, p. 288. ^ June McDaniel 2004, pp. 215-219. ^ Cynthia Bradley 2012, p. 214. ^ Amazzone 2012, pp. 57-59, 63, 66. ^ David R. Kinsley 1989, pp. 19-25. ^ David Kinsley 1988, pp. 106-115. ^ Pratapacandra Ghosa (1871). Durga Puja: with notes and illustrations. Calcutta: Hindoo Patriot Press. pp. 40–55. ^ Hillary Rodrigues 2003, pp. 244-245. ^ June McDaniel 2004, pp. 168-169. ^ Hillary Rodrigues 2003, pp. 66-67, 236-241, 246-247. ^ Constance Jones & James D. Ryan 2006, pp. 308-309. ^ Rodrigues, Hillary (2003). Ritual Worship of the Great Goddess: The Liturgy of the Durga Puja with interpretation. Albany, New York, USA: State University of New York Press. p. 83. ISBN 07914-5399-5. Retrieved 26 October 2015. ^ Anand A. Yang (1999). Bazaar India: Markets, Society, and the Colonial State in Bihar. University of California Press. pp. 123–126. ISBN 978-0-520-91996-9. ^ a b c Sean Williams (2015). The Ethnomusicologists' Cookbook, Volume II. Routledge. pp. 37–38. ISBN 978-1-135-04008-6. ^ a b c d Bruno Nettl; James Porter; Timothy Rice (1998). The Garland Encyclopedia of World Music: South Asia : the Indian subcontinent. Taylor & Francis. pp. 624–628, 980. ISBN 978-0-8240-4946-1. ^ L. Dankworth; A. David (2014). Dance Ethnography and Global Perspectives: Identity, Embodiment and Culture. Springer. pp. 22–25. ISBN 978-1-137-00944-9. ^ "Marcel displays colourful and vivid tradition of Makharotsav". timesofindia.indiatimes.com/. Times of India. Retrieved 26 September 2016. ^ Kerkar, Rajendra P. "In Goa, Navaratri marks worship of earth mother goddess". Oct 17, 2012, 05.37 am IST. Times of India:Goa. Retrieved 1 October 2013. ^ Kamla Mankekar (2004). Temples of Goa. Ministry of I & B, Government of India. pp. 55–56. ISBN 978-81-230-1161-5. ^ Shirgaonkar, Varsha. ""Madhyayugin Mahanavami aani Dasara"." Chaturanga, Loksatta (1996). ^ Bartholomaeus Ziegenbalg; Wilhelm Germann; G. J. Metzger (1869). Genealogy of the South-Indian Gods. Higgenbotham and Company. pp. 100, 106–107. ^ A. Sreedhara Menon (1979). Social and cultural history of Kerala. Sterling. pp. 166–167. ^ Anindita N. Balslev (2014). On World Religions: Diversity, Not Dissension. SAGE Publications. pp. 153–154. ISBN 978-93-5150-405-4. ^ Manu Belur Bhagavan; Eleanor Zelliot; Anne Feldhaus (2008). Speaking Truth to Power. Oxford University Press. pp. 99–105. ISBN 978-0-19-569305-8. ^ India. Office of the Registrar General (1966). Census of India, 1961: Maharashtra. Government of India. p. 132. ^ Roshen Dalal (2010). The Religions of India: A Concise Guide to Nine Major Faiths. Penguin Books. p. 98. ISBN 978-0-14-341517-6. ^ Brahm Dev (October 1973). The Illustrated Weekly of India, Volume 94, Issue 4. Bennett, Coleman & Company. p. 25. ^ a b Peter J. Claus; Sarah Diamond; Margaret Ann Mills (2003). South Asian Folklore: An Encyclopedia. Taylor & Francis. pp. 443–444. ISBN 978-0-415-93919-5. ^ Bharati Shivaji; Avinash Pasricha (1986). ks?id=jpxbZZVGNxUC&pg=PA23. Lancer Publishers. p. 23. ISBN 978-81-7062-003-7. ^ Sarojini Jagannathan (1994). Impact of Śrī Rāmānujāçārya on Temple Worship. Nag Publishers. pp. 184–192. ISBN 978-81-7081-288-3. ^ Aditi Ranjan; M. P. Ranjan (2009). Handmade in India: A Geographic Encyclopedia of Indian Handicrafts. Abbeville Press. pp. 317–318. ISBN 978-0-7892-1047-0. ^ S Sivapriyananda (1995). Mysore Royal Dasara. Abhinav Publications. pp. 155–156. ^ Aya Ikegame (2013). Princely India Re-imagined: A Historical Anthropology of Mysore from 1799 to the present. Routledge. pp. 146–148. ISBN 978-1-136-23909-0. ^ a b Christopher John Fuller (2004). The Camphor Flame: Popular Hinduism and Society in India. Princeton University Press. pp. 46, 83–85. ISBN 0-691-12048-X. ^ Hardenberg, Roland (2000). "Visnu's Sleep, Mahisa's Attack, Durga's Victory: Concepts of Royalty in a Sacrificial Drama" (PDF). Journal of Social Science. 4 (4): 267. Retrieved 29 September 2015. ^ a b Hillary Rodrigues 2003, pp. 277-278. ^ a b June McDaniel 2004, pp. 204-205. ^ Ira Katznelson; Gareth Stedman Jones (2010). Religion and the Political Imagination. Cambridge University Press. p. 343. ISBN 978-1-139-49317-8. ^ Rachel Fell McDermott (2011). Revelry, Rivalry, and Longing for the Goddesses of Bengal: The Fortunes of Hindu Festivals. Columbia University Press. pp. 204–205. ISBN 978-0-231-12919-0. ^ Harlan, Lindsey (2003). The goddesses' henchmen gender in Indian hero worship. Oxford [u.a. ]: Oxford University Press. pp. 45 with footnote 55, 58–59. ISBN 978-0195154269. Retrieved 14 October 2016. ^ Hiltebeitel, Alf; Erndl, Kathleen M. (2000). Is the Goddess a Feminist? : the Politics of South Asian Goddesses,. Sheffield, England: Sheffield Academic Press. p. 77. ISBN 9780814736197. ^ Harlan, Lindsey (1992). Religion and Rajput Women. Berkeley, California: University of California Press. pp. 61, 88. ISBN 0-520-07339-8. ^ Harlan, Lindsey (1992). Religion and Rajput Women. Berkeley, California: University of California Press. pp. 107–108. ISBN 0-520-07339-8. ^ Rodrigues, Hillary (2003). Ritual Worship of the Great Goddess: The Liturgy of the Durga Puja with interpretation. Albany, New York, USA: State University of New York Press. p. 215. ISBN 07914-5399-5. Retrieved 26 October 2015. ^ K Kesavapany; A Mani; P Ramasamy (2008). Rising India and Indian Communities in East Asia. Institute of Southeast Asian Studies. pp. 675–677. ISBN 978-981-230-799-6. ^ Peter van der Veer (1995). Nation and Migration: The Politics of Space in the South Asian Diaspora. University of Pennsylvania Press. pp. 144–145. ISBN 0-8122-1537-0. ^ Peter Childs; Michael Storry (2013). Encyclopedia of Contemporary British Culture. Routledge. p. 271. ISBN 1-134-75555-4. ^ Louis E. Fenech (2013). The Sikh Zafar-namah of Guru Gobind Singh: A Discursive Blade in the Heart of the Mughal Empire. Oxford University Press. pp. 112, 255 with note 54. ISBN 978-0-19-993145-3. ^ Nidar Singh Nihang; Parmjit Singh (2008). In the master's presence: the Sikh's of Hazoor Sahib. History. Kashi. pp. 122 and Glossary. ISBN 978-0956016829. ^ Arvind-Pal Singh Mandair (2013). Sikhism: A Guide for the Perplexed. Bloomsbury Academic. p. 26. ISBN 978-1-4411-1708-3. ^ M. Whitney Kelting (2001). Singing to the Jinas: Jain Laywomen, Mandal Singing, and the Negotiations of Jain Devotion. Oxford University Press. pp. 87–88. ISBN 978-0-19-803211-3. Amazzone, Laura (2012). Goddess Durga and Sacred Female Power. University Press of America. Retrieved 5 February 2017. Coburn, Thomas B. (1991). Encountering the Goddess: A translation of the Devi-Mahatmya and a Study of Its Interpretation. State University of New York Press. ISBN 0791404463. Cynthia Bradley (2012). Denise Cush; Catherine Robinson; Michael York, eds. Encyclopedia of Hinduism. Routledge. ISBN 978-1-135-18979-2. Alain Daniélou (1991). The Myths and Gods of India: The Classic Work on Hindu Polytheism from the Princeton Bollingen Series. Inner Traditions / Bear & Co. ISBN 978-0-89281-354-4. Lynn Foulston; Stuart Abbott (2009). Hindu Goddesses: Beliefs and Practices. Sussex Academic Press. ISBN 978-1-902210-43-8. Constance Jones; James D. Ryan (2006). Encyclopedia of Hinduism. Infobase Publishing. ISBN 978-0-8160-7564-5. David Kinsley (1988). Hindu Goddesses: Visions of the Divine Feminine in the Hindu Religious Tradition. University of California Press. ISBN 978-0-520-90883-3. David R. Kinsley (1989). The Goddesses' Mirror: Visions of the Divine from East and West. State University of New York Press. ISBN 978-0-88706-835-5. James G. Lochtefeld (2002). The Illustrated Encyclopedia of Hinduism: N-Z. The Rosen Publishing Group. ISBN 0-8239-2287-1. Malcolm McLean (1998). Devoted to the Goddess: The Life and Work of Ramprasad. State University of New York Press. ISBN 978-0-7914-3689-9. June McDaniel (2004). Offering Flowers, Feeding Skulls: Popular Goddess Worship in West Bengal. Oxford University Press. ISBN 978-0-19-534713-5. Rachel Fell McDermott (2001). Mother of My Heart, Daughter of My Dreams: Kali and Uma in the Devotional Poetry of Bengal. Oxford University Press. ISBN 978-0-19-803071-3. Hillary Rodrigues (2003). Ritual Worship of the Great Goddess: The Liturgy of the Durga Puja with Interpretations. SUNY Press. ISBN 978-0-7914-8844-7. "Navratri – Hindu festival". Encyclopedia Britannica. 2017-02-21. Retrieved 2017-02-21. Wikimedia Commons has media related to Navaratri.